Kay may have had his reservations, but there are few things more satisfying than the simple combination of good bread and garlic. Bruschetta made from toasted bread straight off the barbeque – rubbed with garlic and drizzled in olive oil – is one of life’s greatest pleasures, but for something with a little more rib-sticking clout, it’s hard to beat a buttery stick of good homemade garlic bread. For many, those two words might conjure up the image of spaghetti and meatballs, red and white checked tablecloths, dodgy Italian accents and bottles of Chianti dripping with candle wax. For me, it’s my younger years. When I was little, my Mum would keep me and my brother quiet in the supermarket by tearing the end off a crusty baguette for us to chew on as we rolled up and down the aisles. Later, the same baguette would reappear as a tea-time treat, thinly scored, wedged with garlic butter and wrapped in a blanket of tin foil. Peeling back the shiny layers would reveal a toasty brown crust, buttery crumb and thin sheen of greasy, parsley-flecked goodness; the ultimate challenge being to break into the package without burning your fingers or mouth. Dangerous but utterly delicious. Nowadays you can buy the stuff in stiff little supermarket packets everywhere; anaemic-looking loaves that live in the fridge alongside microwave meals and other substances designed as much to fill stomach space as to provide any real eating pleasure. Reading that sentence back I realize that making my own bread may have made me more than a bit militant, but the difference between this homemade version and the garlic bread you can buy in the shops really is massive, I promise. I’m not even saying you have to make your own bread. Yes, it feels amazing (possibly in a slightly smug way) to make the whole thing from scratch. But you can also get great results from a (good) shop-bought baguette. Just make sure it’s the wider kind, not one of those super-thin baguettes which don’t hold enough butter and tend to get a little dry in the baking. I made these baguettes for a big family dinner party last night. With eight people coming, I thought four fairly large baguettes might be a little excessive. Carniverous Boyfriend thought otherwise. And he was right. Alongside starters, two huge lasagne and bowls brimming with salad, we devoured the lot. We probably could have eaten half as many again, everyone diving in gleefully to tear and share the crusty, garlicky goodness. And yes, the obligatory cry of ‘Garlic bread? !’ may have been heard across the dinner table, but with mouths full of delicious homemade bread and hands reaching for more, we hardly had the strength to raise an eyebrow in addition. One quantity of homemade white dough, rested for one hour (using Richard Bertinet’s recipe here – follow my instructions up to the point where you leave the dough to rest for an hour, then pick up with the directions below). Turn your risen dough onto a lightly floured surface. Cut into four equal sized pieces – they should weight about 215g each. Flatten each piece with the heel of your hand to form an oval shape, then fold each edge into the centre of the dough to form a tight ball. Leave to rest for a further five minutes. To mould the baguettes, take the first ball, turn it rounded side down and flatten to a rough oval. Fold one side of the flattened dough into the middle and seal with the heel of your hand. Repeat with the other side of the oval so the two edges meet in the middle, seal, then fold the whole thing in half lengthways and seal the edges so you end up with a long log shape. It won’t be quite long enough at this stage, so roll until you get your desired length (ideally the same length as the tray on which you’re going to bake it!). Place on a floured tea towel and repeat with the remaining three balls of dough. 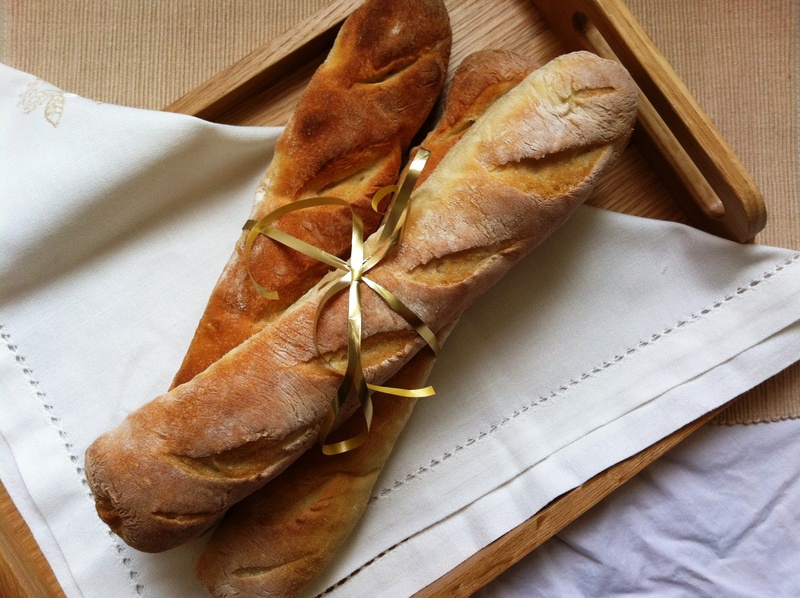 Lay the four baguettes on a floured tea towel, making a pleat between each loaf to stop them touching as they rise. Cover with another tea towel and leave to prove for 45 – 60 minutes, or until nearly doubled in volume. Preheat the oven to 250 degrees C (or as high as it will go). Once risen, slash the tops of the baguettes using a razor or sharp knife. Transfer carefully to your baking stone or preheated tray and bake for 10 – 12 minutes until the crust is lightly golden brown (using a mist spray in the oven will help achieve a lovely crunchy crust. As you’ll be baking them again with the garlic butter, I’d err on the side of less golden crust in this instance. Mash together the butter, garlic and parsley in a small bowl until completely combined. Place the mixture on a large piece of cling film and roll out into a thin sausage shape. Roll the cling film round your sausage, twist up the ends, and pop in the fridge to firm up. This quantity will make more than you need for the four loaves, but any you don’t use can be frozen in small rounds and melted over steak or added to sauces at a later date. Preheat the oven to 200 degrees C. Tear out four large squares of tin foil, slightly wider and longer than your baguettes. Using a breadknife, cut slits down the length of each baguette, making sure you don’t cut the whole way through. 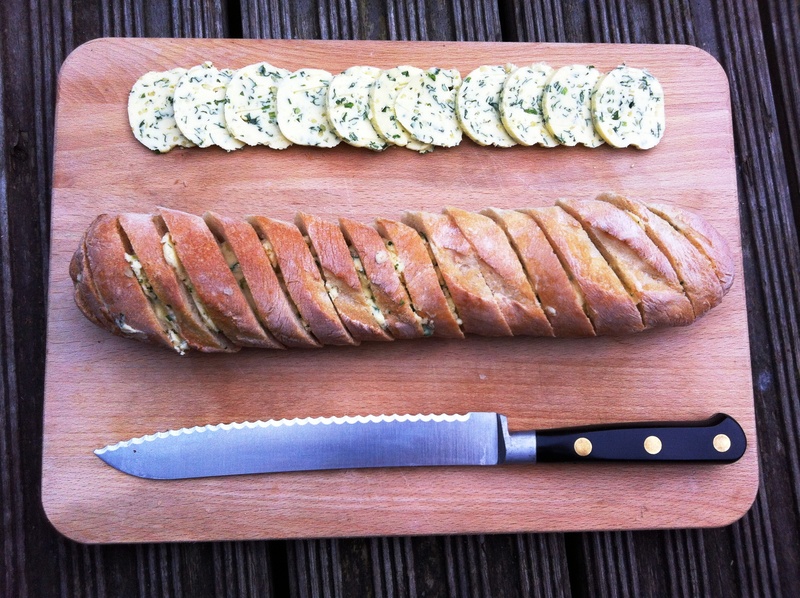 Remove your garlic butter baton from the fridge, cut into thin slices and wedge one slice in between each slit. Place each baguette on a piece of foil and wrap loosely. Bake for 10-15 mins, opening the foil for the last 5 minutes if you like your baguette nicely brown and crispy. Remove from the oven, allow to cool slightly, then serve. This bread looks to die for! This looks amazing! 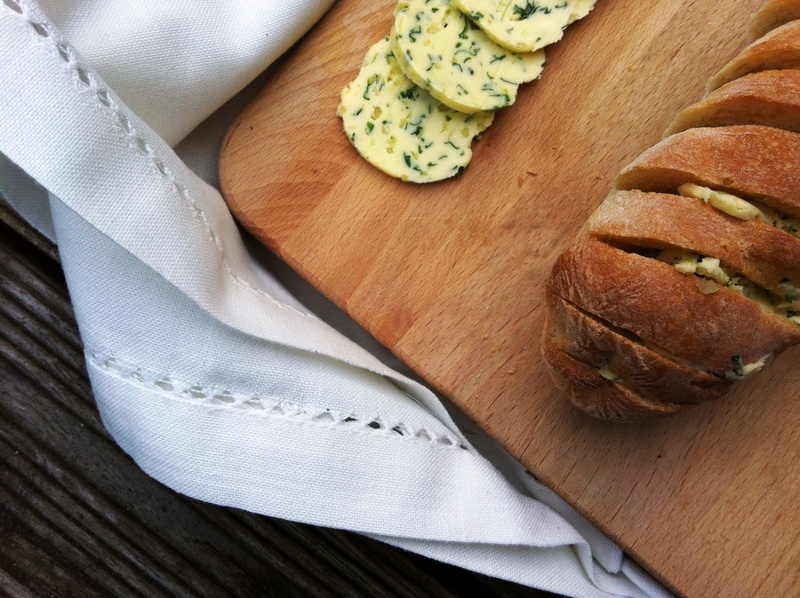 Homemade garlic bread – it doesnt get better than that. I’m sure everyone loved it. I really need to get into making my own bread! Mmmmm, saw them last night on Twitter. Look just gorgeous. I regularly make garlic bread with leftover baguettes that need using up. 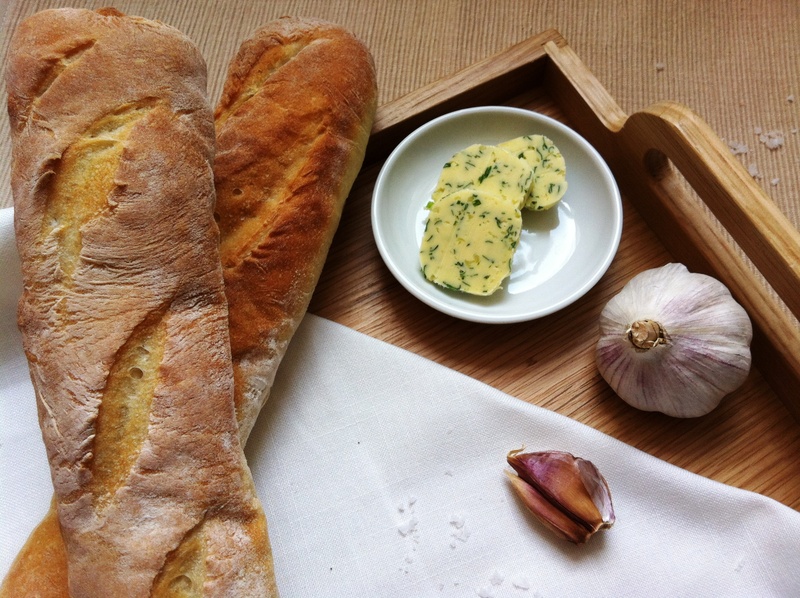 I can only imagine how good garlic bread would taste with home-made baguettes, so I will try it myself and see. Would be hard not to eat a loaf in one go though! Ruthie – I have a feeling some of my readers from outside the UK might not get the reference, but glad it makes you giggle 🙂 And thanks re photos – I was really pleased with how they came out. Erin – Christmas eve crab supper sounds amazing. We normally have sausages or smoked salmon and ham – nothing too heavy to prepare ourselves for feasting the next day! Laura – it’s pretty hard to exert any self control when these are fresh out the oven. I never thought 8 people could get through 4 loaves, but they were gone in minutes! My word, but these look incredible. And having just made cheesy garlic bread for my husband last night (to accompany some spinach and asiago ravioli — yum! ), I know it would be more than a hit — it would become a habit. ‘The Italians like the same food only made better and better’ Anna del Conte. This is epitomised by your post. You’ve taken garlic bread from the ordinary to the sublime. Lovely, lovely pics. I haven’t seen the Peter Kay sketch but your baguettes look amazing! Not made baguette myself, would love to, you have inspired me! I don’t know the Peter Kay sketch either but I do know that I like garlic bread a lot! One of my friends makes the most garlicky garlic bread I’ve ever had and it’s just wonderful! Your baguettes look delicious too – what a gorgeous colour. omg just look at all that garlic butter tucked in between the bread. swoon. Wonderful! I love garlic bread but have never made the bread from scratch…just used shop bought loaves. I shall follow your instructions! I want to eat it right now and it’s only 9am! i love garlic bread and this looks fabulous ! I don’t think I eat enough garlic bread. Your post has made me reach this conclusion. Also those photos look great – did you get a new camera or are you still using the iPhone? Meister – you could add cheese to this recipe. Try grating a little parmesan into the butter before chilling it for a subtle cheesy flavour. Sally – ah, thank you 🙂 I had a play around with the styling on these and was pleased with the pics so really glad you like. Lorraine – you definitely can’t just have one piece! Shu Han – thank you. A couple of other bloggers have nominated me too so promise to get my answers up soon! 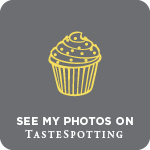 A Spoonful of Yum – thank you! Just right now, I’m making homemade bread, and plan to make a garlic cheese bread out of one part. I’ll just add slices of gruyere cheese with the butter. Your garlic bread looks delicious, too! oh yum – I adore garlic bread and this looks awesome! It’s been a while since I made my own garlic bread. You have inspired me to do it again. Beautiful photos. You’re method of slicing the bread is simply genius! I’ve always seen garlic bread with the bread sliced in half but those make such big bready slices. This is perfect. This recipe looks delicious! Seems like it would be perfect for a crowd since it can be assembled in advance. I might need to keep some extra garlic butter in my refrigerator…I have a feeling it would be a good addition to almost anything! Lisa – ah, my pleasure! I can’t take any credit for this method of making it – I learnt it all from my Mum. Lena – garlic bread with a little cheese is delicious too, yum. Purely Food – thank you. Dima – nothing wrong with garlic bread at 6am! Navy Blue Kitchen – they are perfect for crowds – I made them for a hungry hoard of cousins last weekend! Yum and gulp! This looks amazing!! !